Germline mutations in the tumor suppressor PTEN predispose human beings to breast cancer, and genetic and epigenetic alterations of PTEN are also detected in sporadic human breast cancer. Germline Pten mutations in mice lead to the development of a variety of tumors, but mammary carcinomas are infrequently found, especially in mice under the age of six months. To better understand the role of PTEN in breast tumor development, we have crossed Pten heterozygous mice to MMTV-Wnt-1 transgenic mice that routinely develop ductal carcinomas in the mammary gland. Female Wnt-1 transgenics heterozygous for Pten developed mammary tumors earlier than Wnt-1 transgenics that were wild type for Pten. In most tumors arising in Pten heterozygotes, the Pten wild-type allele was lost, suggesting that cells lacking Pten function have a growth advantage over cells retaining a wild type allele. Tumors with LOH contained high levels of activated AKT/PKB, a downstream target of the PTEN/PI3K pathway. An animal model has been developed in which the absence of Pten collaborates with Wnt-1 to induce ductal carcinoma in the mammary gland. This animal model may be useful for testing therapies specific for tumors deregulated in the PTEN/PI3K/AKT pathway. Cancer evolves from the accumulation of mutations and the deregulation of two classes of genes, oncogenes and tumor suppressor genes. The large majority of breast cancers arise in epithelia of the breast, and they are thought to evolve from hyperplasia with atypia to carcinoma in situ, invasive carcinoma, and, finally, metastatic disease. The molecular mechanisms leading to breast malignancies are unclear, but many genetic abnormalities and epigenetic factors have been implicated, including changes affecting known tumor suppressor genes (p53, BRCA1, BRCA2, PTEN/MMAC1/TEP1) and proto-oncogenes (neu/ErbB2/HER2, ErbB1/EGFR, PRAD-1/cyclin D1, Mdm2, and c-myc) [reviewed in ref. 1]. The gene product of PTEN (phosphatase and tensin homolog deleted from chromosome 10) is a lipid phosphatase that reverses the activities of phosphatidylinositol 3-kinase (PI3K) by dephosphorylating the D3 position of its lipid products, phosphatidylinositol-3, 4 bis-phosphate (PtdIns(3,4)P2), phosphatidylinositol-3,5 bis-phosphate (PtdIns(3,5)P2), and 3,4,5-tri-phosphate (PtdIns(3,4,5)P3) [2, 3], the elevated levels of which are linked to the transforming ability of PI3K [reviewed in ref. 4]. PtdIns(3,4)P2 and PtdIns(3,4,5)P3 recruit AKT (also known as protein kinase B [PKB]) to the membrane through the N-terminal pleckstrin homology (PH) domain of AKT [reviewed in ref. 5]. Membrane localization renders AKT permissive to phosphorylation by phosphatidyl inositol-dependent kinases, PDK1 and PDK2, at Thr308 within the activation loop and at Ser473 near the carboxyl terminus. Phosphorylation activates the kinase domain of AKT, which, in turn, phosphorylates target proteins on serine and threonine residues. Substrates of AKT include glycogen synthase kinase 3 (GSK3), p70/S6 kinase, BAD, Caspase 9, 4E-BP1, IκB kinase α and members of the Forkhead transcription family [reviewed in ref. 6, 7]. Constitutive membrane localization of AKT leads to its deregulated activation and can induce oncogenic transformation [8, 9]. All three human members of the AKT family are over-produced in various human cancers. AKT1 is over-expressed in gastric adenocarcinomas and breast cancer cell lines, AKT2 is amplified and over-expressed in pancreatic, ovarian, and breast cancers, and AKT3 is upregulated in estrogen receptor-deficient breast cancer and in androgen-independent prostate cell lines [reviewed in ref. 6]. Consistent with the role of PTEN as a lipid phosphatase, PTEN-deficient human and mouse cells have elevated levels of intracellular PtdIns(3,4,5)P3 [10, 11] and demonstrate constitutive activation of AKT in the absence of growth factors [12,13,14]. The relationship between components of this pathway is also conserved in flies and worms. A germline mutation in PTEN is associated with multi-neoplastic, autosomally dominant syndromes in humans, such as Cowden disease and Bannayan-Zonana syndrome (also known as Bannayan-Riley-Ruvalcaba syndrome), and 20-50% of affected females in these families develop breast cancer [15,16,17]. The PTEN gene is also frequently deleted or mutated in a variety of sporadic human malignancies, such as glioblastoma and carcinomas of the prostate, endometrium and breast. Although somatic mutations in the gene have been detected in only about 1% of breast cancers, loss of heterozygosity (LOH) at the PTEN locus (10q23) is frequently found (approximately 40%), and 33% of breast tumors have no detectable, or reduced, levels of the protein product [18,19,20,21,22]. Three independent mouse lines carrying inactivating Pten mutations have been made [23,24,25]. All mice homozygous for these Pten mutations die during early embryogenesis. By 6 months of age, heterozygous mice develop tumors of the lymphoid system, colon, uterus, and adrenal medulla with very high penetrance, and tumors of the prostate and thyroid with lower penetrance. While benign mammary lesions, usually fibroadenomas, are found in female mice after 7 months of age, few animals develop ductal carcinomas [KP and RP, unpublished; 26], which account for over 85% of human breast cancers. In an effort to develop a model for studying the effects of Pten inactivation in mammary oncogenesis, we have introduced an additional genetic alteration, an MMTV-Wnt-1 transgene, by breeding Pten heterozygotes  with MMTV-Wnt-1 transgenic (TG) mice . Female mice harboring the Wnt-1 transgene develop extensive mammary hyperplasia early in life, and 50% of them develop mammary ductal carcinomas by 6 months of age . This transgene has been shown to collaborate with Fgf-3 and inactivation of p53 to accelerate the appearance of mammary tumors [28, 30]. After a mutant allele of Pten was crossed into Wnt-1 TG mice, we found that ductal carcinomas appeared earlier than either alteration alone and that LOH at the Pten locus occurred in the majority of these tumors, suggesting a selective growth advantage in cells that lack Pten functions. Wnt-1 TG mice have been used to assess the functions of a number of genetic lesions in breast carcinogenesis because tumors appear with predictable kinetics. The median age at which tumors are detected is 5-6 months in MMTV-Wnt-1 TG females [27, 28, 30, 31]. After one mutated allele of Pten was bred into this transgenic line, tumors appeared significantly earlier than in sibling females harboring only a MMTV-Wnt-1 transgene (P < 0.001, Fig. 1A). 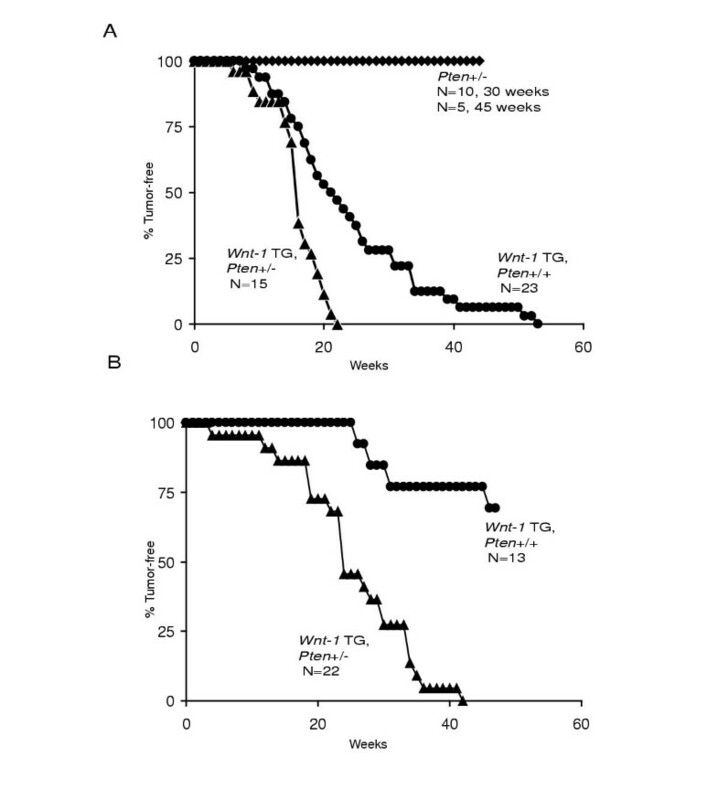 Fifty percent of Pten+/-, Wnt-1 TG female mice formed tumors by 3.5 months, 2.5 months earlier than Wnt-1 TG mice (Fig. 1A). While it took one year for the entire cohort (15) of Wnt-1 TG females with a wild type Pten background to develop tumors, all Wnt-1 TG, Pten+/- females showed tumors by 5 months of age. Five each of Pten+/- mice without a Wnt-1 transgene were monitored for 7 months and 10.5 months, but none developed any palpable mammary lesions. These observations differ from a recent report that one of the other two Pten+/- lines develops fibroadenomas and adenocarcinomas in the mammary tissue after 7 months of age . The lack of a mammary phenotype in our studies could be due to differences in the targeting constructs, the genetic backgrounds, or even environmental agents. 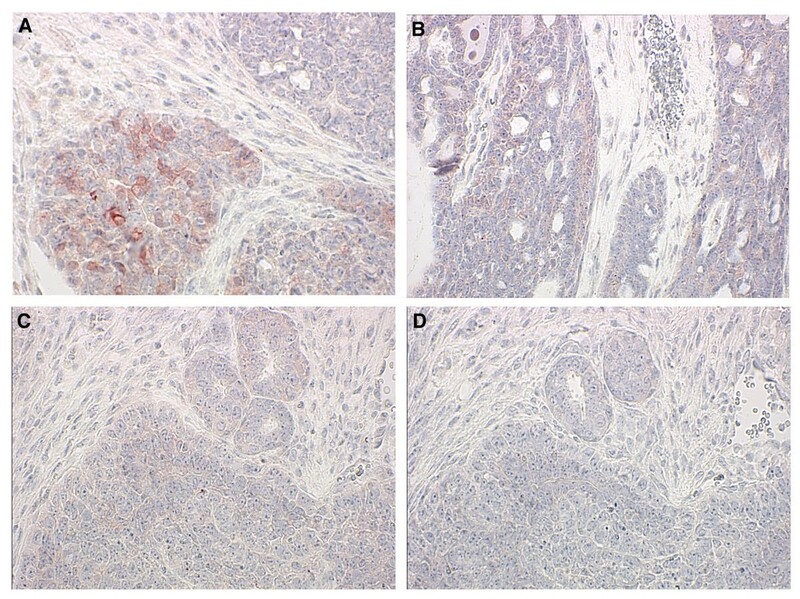 Pten heterozygosity accelerates tumor appearance in Wnt-1 TG females (A) and males (B). Percentages of mice that were tumor-free, as determined by weekly visual inspection and/or palpation, were plotted against the age when tumors were found. Genotypes and sizes are as indicated. For the Pten+/- female group without the Wnt-1 transgene, 10 mice were monitored to 30 weeks of age; among the 10 mice, 5 were kept for another 15 weeks of age. (A) All mice showed at least one adenocarcinoma. (B) The Wnt-1 TG, Pten+/+ cohort (13) had 1 mammary and 3 salivary tumors, and the Wnt-1 TG, Pten+/- cohort (22) had 2 mammary, 6 muzzle, and 14 salivary tumors. By one year of age, approximately 15% of Wnt-1 TG males have been reported to develop mammary tumors [27, 28, 31]. In our cross, one of the four tumors from Wnt-1 TG males, in an otherwise wild type background, was a mammary carcinoma; the other three tumors were salivary in origin, with a similar histopathology to the mammary lesion. The appearance of tumors was greatly accelerated in the Pten heterozygous background (Fig. 1B). Fifty percent of males developed tumors by 5.5 months of age, and all developed tumors within 10 months. 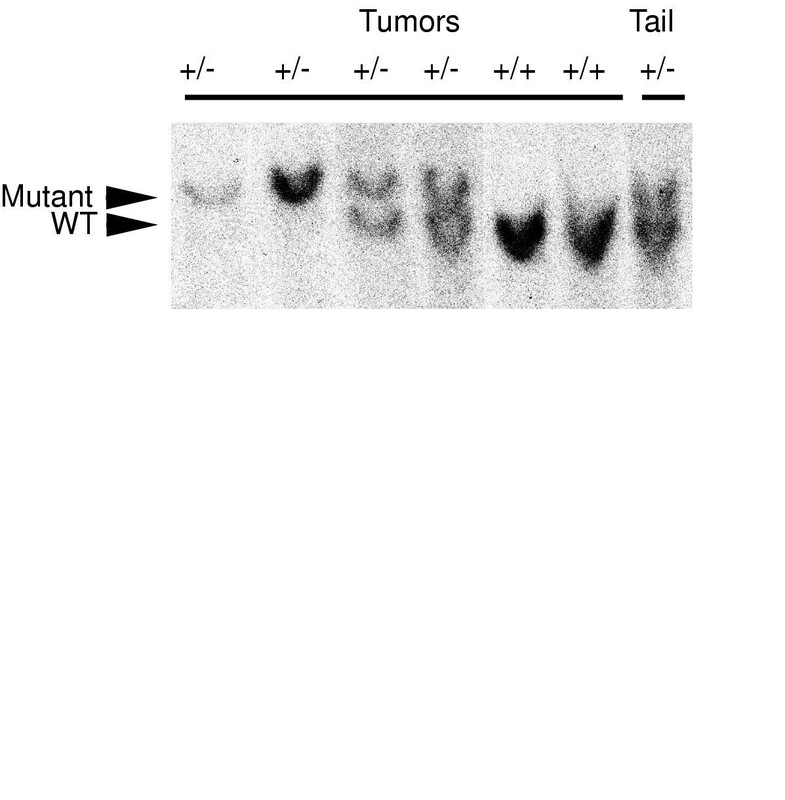 As in the case of Wnt-1 TG male mice without Pten mutations, the majority of tumors (14/22) arose in the salivary tissue; only a small number of tumors (2/22) were mammary in origin, and, interestingly, some (6/22) were bilateral or unilateral muzzle tumors of epithelial origin, similar histopathologically to lesions found in mammary and salivary tissues. Example of LOH analysis. Blots of tumor and tail DNAs, digested with Pst I, were probed with a 32P labeled Pten probe. Two bands could be observed, representing wild type and mutant alleles, as indicated at the left. Genotypes of mice are shown at the top. To determine if the wild type allele of Pten was inactivated in tumors arising in a Pten+/- background, 11 tumors from Wnt-1 TG, Pten+/- mice were examined for LOH by Southern hybridization. Seven tumors had lost the wild type Pten allele (see Fig. 2 for an example of the analysis). This result suggests that, in tumorigenesis, cells that lack a functional allele of Pten have a significant proliferative advantage over the cells that retain the normal copy of Pten. Histological examination showed that tumors from Wnt-1 TG mice, regardless of Pten status, were adenocarcinomas with cribriform, cystic and focal papillary growth patterns. However, 3 of the 6 tumors that were Wnt-1 TG, Pten +/- with LOH appeared to have a higher nuclear grade, more cellular stroma and a more infiltrative pattern compared to the tumors without a Pten defect (Fig. 3), suggesting a more aggressive phenotype. Representative H+E sections of mammary tumors from progeny females of the MMTV-Wnt-1 and Pten+/- cross. Sections were from tumors that were Wnt-1 TG+, Pten+/+ (A); Wnt-1 TG+, Pten+/- (B); and Wnt-1 TG+, Pten+/- with LOH (C and D). A 40x objective was used. Blue arrows indicate the smooth boundaries of tumors, red arrow marks the infiltrating front of the tumor, and white arrows label the highly cellular stroma. (D) shows a part of an intraductal squamous lesion. In human cancer, a tumor suppressor gene can be inactivated by mutations, chromosomal loss, promoter silencing, and other means. To determine if the Pten protein was produced in Wnt-1 TG, Pten+/- tumors that did not undergo LOH, sections were analyzed using an immunohistochemical assay with a polyclonal rabbit antibody. Abundant amounts of Pten were detected in mammary ducts from wild type mice. Pten was detected, at reduced levels, in both hyperplastic ducts and mammary tumors that did not have LOH at the Pten allele (Fig. 4), suggesting that Pten was, indeed, made from the second allele. Similar low levels of Pten were also detected in mammary ductal epithelial cells in Pten heterozygous mice that did not have a Wnt-1 transgene, suggesting that the Wnt-1 transgene does not influence Pten expression. As expected, Pten was not detected in tumors that had undergone LOH at the Pten locus (Fig. 4E). Immunohistochemical staining for Pten. 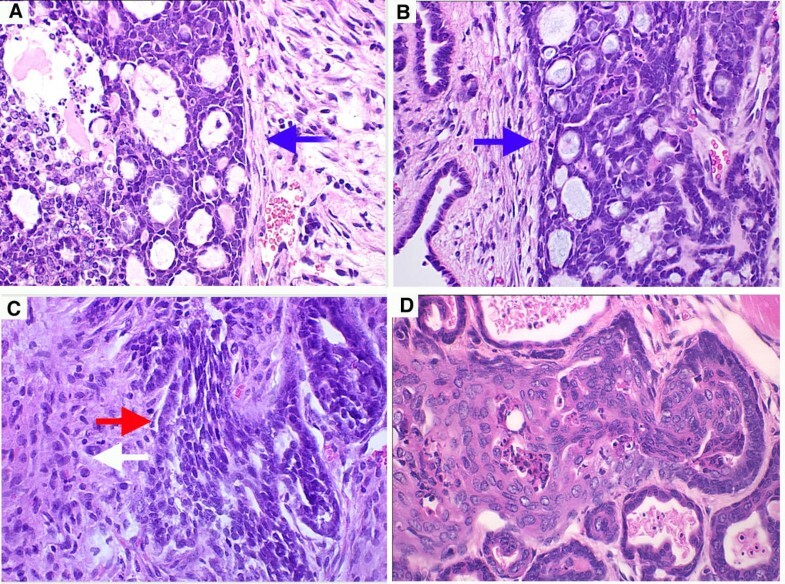 Sections of mammary glands (A, D) and tumors (B, C, E, F) were stained for Pten (A, B, D, E, F) or control rabbit Ig (C) and counterstained with hematoxylin. Genotypes of mice were Pten+/+ (A); Wnt-1 TG, Pten+/+ (B); and Wnt-1 TG, Pten+/- (C-F). (E) and (C, F) were from tumors with or without LOH, respectively. A 40x objective was used. Inactivation of Pten promotes membrane recruitment of AKT and its subsequent activation by phosphorylation at Ser473 and Thr308 [10, 11, 13]. All three human isoforms of AKT have been found to be deregulated in human breast cancer cells [32,33,34]. To determine if activated AKT was increased in tumors that had a Pten defect, these sections were stained using an antibody that specifically detects AKT1 phosphorylated at Ser 473 (and AKT2 and AKT3 phosphorylated at equivalent sites). Tumors that were Wnt-1 TG, Pten+/- with LOH displayed staining of phosphorylated AKT (Fig. 5A). Surprisingly, the staining was patchy, suggesting additional factors may be required for AKT activation. As expected, phosphorylated AKT was undetectable in hyperplastic ducts, in tumors from Wnt-1 TG, Pten+/+ mice, and tumors from Wnt-1 TG, Pten+/- mice that retained the wild type allele (Fig. 5B & C). Immunohistochemical staining for phosphorylated Akt. Sections of tumors were stained for phospho-Akt (A, B, C) or control rabbit IgG (D) and counterstained with hematoxylin. Genotypes of mice were Wnt-1 TG+, Pten+/- (A, B); Wnt-1 TG+, Pten+/+ (C, D). (A) and (B) were from tumors with or without LOH, respectively. A 40x objective was used. Several apoptotic pathways may be inhibited upon activation of AKT, promoting maintenance and survival of tumor cells. Cellular proliferation may also be enhanced by activated AKT, which inhibits p27 and GSK-3 (leading to stabilization of cyclin D1) . However, tumors from Wnt-1 TG, Pten+/+ mice have low apoptotic rates (40 ± 16 per digital camera field using a 20x objective) and high proliferation rates (53% ± 11). Neither apoptotic nor proliferation rates were affected by the status of Pten when measured by the TUNEL (terminal deoxynucleotidyltransferase-mediated UTP end labeling) assay, which labels the ends of fragmented DNA present in apoptotic cells, and immunohistochemical staining for Ki67, a cell proliferation marker (data not shown). Most Wnt-1 TG mice (38/49) developed only one palpable tumor regardless of Pten status. Fifty-three of 55 single sections from Pten+/+ glands that were free of a palpable mass did not show any lesions more advanced than ductal hyperplasia. 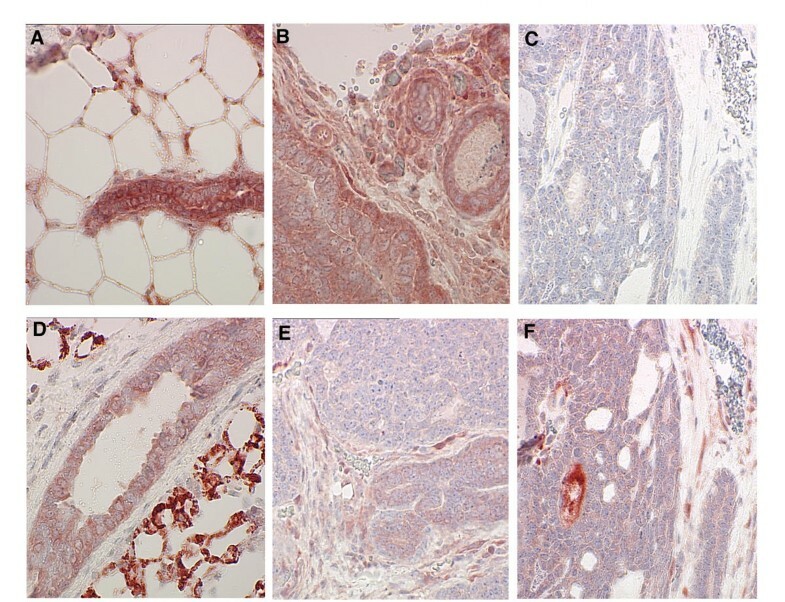 However, at the time of sacrifice, the majority (50/56) of glands from Wnt-1 TG, Pten+/- mice had intra-ductal squamous lesions of various sizes (Fig. 3D). These squamous lesions were usually multi-focal and located both at the periphery of the adenocarcinomas and in other mammary glands free of adenocarcinomas. Mouse models are valuable research tools for the study of the molecular mechanisms of oncogenesis and for the testing and screening of cancer therapeutic agents targeted to specific oncogenic lesions. In order to produce such a model for studying the effects of Pten mutations in breast cancer, we have crossed Wnt-1 TG mice to mice heterozygous for Pten. Mice transgenic for MMTV-Wnt-1 and heterozygous for Pten developed mammary adenocarcinomas much earlier than mice carrying either lesion alone. The majority of tumors in Wnt-1 TG, Pten+/- mice had lost the wild type allele of Pten, suggesting that the complete inactivation of Pten function provides an additional growth advantage to these tumors. LOH at the Pten locus has recently been reported in mammary tumors arising in Pten heterozygous mice , but only 4% of the mice developed tumors before the age of 30 weeks, and, in our cross, none of the Pten+/- mice without the Wnt-1 transgene had a palpable mammary tumor before the age of 30 weeks. LOH at the Pten locus has also been reported in adrenal and lymphatic tumors, but not in uterine tumors and prostate lesions in Pten+/- mice [KP & RP, submitted; 38]. Activated AKT was more abundant in tumors that were Wnt-1 TG, Pten +/- with LOH, as has been shown for uterine tumors in Pten heterozygous mice (KP, RP, submitted). The presence of areas unstained with antibody specific for phosphorylated AKT suggests that additional factors other than Pten may influence the activation of AKT. Neither apoptosis nor proliferation, as determined by the TUNEL assay and KI67 staining, was significantly different between tumors heterozygous for Pten (with or without LOH) and those without a Pten defect. This result may seem paradoxical since increased phosphorylated AKT, due to inactivation of Pten, suppresses apoptosis and promotes proliferation. However, tumors in Wnt-1 TG mice in a wild type Pten background already have highly suppressed apoptosis and accelerated proliferation rates, and any incremental changes, if present, may be difficult to detect with our current assays. Nonetheless, a seemingly minor difference in either apoptosis or proliferation could have a dramatic impact on tumor growth over time. Accelerated appearance of mammary adenocarcinomas in the presence of a Pten mutation suggests a synergy between Pten inactivation and the Wnt-1 transgene. The apparent cooperation of these two genetic factors is further strengthened by our finding that the majority of tumors arising in a Pten+/- background have lost the wild type allele. To date, heterozygous inactivation of any of the other tumor suppressor genes implicated in breast cancer, including P53, Brca1, Brca2, and Rb, has failed to cooperate with Wnt-1 in promoting the appearance of mammary tumors [reviewed in ref. 39]. Therefore, it is possible that the signal pathway controlled by Pten is one of the preferred partners of the Wnt-1 pathway in cancer progression, although it remains possible that LOH at the Pten locus is more likely to occur than for the other alleles crossed into Wnt- 1 TG mice. Even though Wnt-1 has not been directly implicated in human cancers, many components of the Wnt signaling pathway (such as β-catenin, APC, c-myc, and cyclin D 1) are involved in human tumors including breast cancer [reviewed in ref. 40]. One of the goals of mouse modeling efforts is to provide an opportunity for pre-clinical testing of generalized or mechanism-specific therapeutics in a defined genetic setting. Many human breast tumors have reduced levels of PTEN, hence inhibitors of the cell signaling pathways affected by PTEN could be tested in the model we have developed. One such candidate is the rapamycin analog CCI779, which has been suggested to inhibit the AKT signaling pathway, probably through inhibition of mTOR (target of rapamycin), a potential target of AKT [reviewed in ref. 41]. CCI779 has been shown to have inhibitory effects on the growth of Pten-deficient tumors in the uterus and prostate in mice (KP & RP, submitted; M. Neshat & C. Sawyers, submitted). Since tumors arise rapidly after a copy of Pten is inactivated, and with predictable kinetics, this model may be useful for testing the efficacy of these therapies. Results presented here and published earlier [15,16,17,18, 26] have clearly demonstrated the significant impact of Pten on mammary oncogenesis. Future testing will examine the tumorigenic effects caused by other kinds of genetic damage in the signaling pathways affected by Pten. The TVA-directed gene delivery system [reviewed in ref. 42] can be used to introduce viral vectors carrying genes encoding an activated form of PI3K, AKT, or candidate substrates for AKT into the mammary tissue of Wnt-1 TG mice. This would allow the testing of therapeutic interventions directed to specific steps of the signaling pathway regulated by Pten. MMTV-Wnt-1 TG mice  and those that carry a mutant allele of Pten  have been described. Male Wnt-1 TG mice (a mixture of FVB, SJL, and C57BL/6) were crossed with Pten heterozygous females (a mixture of C57BL/6 and 129SvJ) to generate all three genotypes used in this paper: Wnt-1 TG, Pten+/-; Wnt-1 TG, Pten +/+; and Pten+/-. Genotyping for the Wnt-1 transgene was done using PCR as described ; PCR using primers from the neo cassette was performed to detect the Pten knockout allele. Mice were monitored weekly for tumor formation by visual inspection and/or palpation; most tumors were found when they were approximately 0.5 cm. Most of tumors were harvested for further analysis when they were 1.5 cm in diameter. Tissues were fixed in 10% buffered formalin and paraffin-embedded. For histological survey, one H-E section per block was analyzed. Formalin-fixed and paraffin-embedded sections were deparaffined and rehydrated in several changes of xylene, ethanol, and water. Antigen-unmasking was achieved by boiling the slides for 15 minutes in citrate buffer, pH 6.0, or 1 mM EDTA. Endogenous peroxidase activity was inactivated by a 5 minute incubation in 3% hydrogen peroxide, when needed. Immunohistochemical stainings were performed using Vector ABC kits (Vector Laboratories) following the manufacturer's recommendations and as described . Rabbit antibodies against Pten, Ki67, and AKT phosphorylated at Ser 473 were from Neomarkers, Dako, and New England BioLabs, respectively. The TUNEL assay was performed as described . DNAs extracted from tissues and tumors were digested with Pst I, followed by electrophoresis, and blotted to Nylon+ membrane. Hybridization was done in ExpressHyb solution (Clontech) at 60°C using a 32P dCTP-labeled probe that was synthesized from a 0.9 Kb template located in intron 5 of Pten  using the RTS RadPrime DNA labeling system (Life Technologies). The probe was incubated with Cot-1 DNA (Life Technologies) at 70°C for 10 minutes before addition to the hybridization solution. We thank Jennifer Doherty and Wendy Hively for technical assistance; Maria Merino and Carlos Cordon-Cardo for consultation on pathology samples; Osseh Saine, Marlon Scopio, and Jose Vargas for excellent animal care. YL is a recipient of the US Army Breast Cancer Research Program Fellowship Award.